For a few weeks already, we have more or less stabilized to a predictable milk & solids schedule. 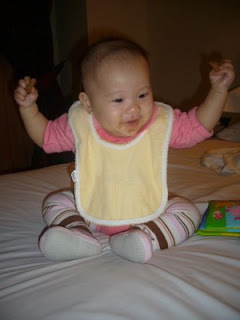 Figured out what to feed Eliza, and since she started or porridge, she seemed to love food better. It's great to have my curious & playful & chatterbox Eliza back. After almost a week of cutting her milk intake and being completely off solids, and one or two days of a lot of sleeping (which is one of the 'side effect' of Roseola), she's back in action! Somehow, i felt she has changed a little, in a way that she has seemed to have grown up a little bit. I really don't know how to explain it. It's great, but she's up and about always wanting to grab something. I'm ok with some things but newspapers, remote controls, stationery are some of the many many no-nos in the house. For now the concern is not just that she'll destroy these things, she will eat almost everything she gets her hands on...even those that she doesn't. (ie. 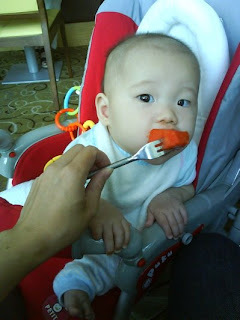 eating the table, eating the high chair, and this morning at church, eating the playmat). And she goes at it with such vigor that i really have to put in quite an amount of strength to pry her away from it. honestly, it usually sends me laughing. "My ideal garden would be one with a cubby house for my kids to play in while I lounged on our teak furniture and read a book or worked from my laptop on the patio. That way I could keep an eye on the kids while catching up on some reading, emails or blogging at the same time. Now that’s the life!" how nice! first i have to wish i have a big house....hmm..
this was day 2 of her Roseola outbreak...rashes all over her pretty face and body. she slept till 9am that day...which is not normal..the latest she wakes up is about 815am. this is actually part of the video we took...but because we found this frame of the video so cute, i just had to save it as a jpeg..don't get me wrong about the pic, she was enjoying it so much i could hear her squealing and laughing from the far end of our house. today at church...it does take her a while to warm up to church environment...though by the time she warms up she'll be 'singing' away. 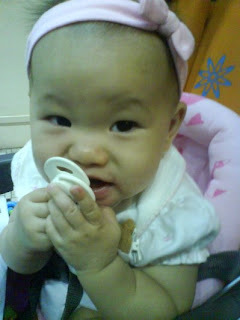 so her pacifier keeps her silent...at least till it drops...but sometimes she'll help us to put it back. i think she had enough of being in the stroller, being on my lap, so i thought i'll bring her to the cry room...to have some fun! ok..at first she cried when i put her down..but after that she was so happy she was singing away. i didn't know it was so loud, she could be heard outside. not too soundproof uh. now...you wonder what is she doing...nope, she isn't sleeping. i don't know either. checking out the pram structure?? Just for fun, and for me to recall when i have forgotten the price...this is what i usually get and where. diaper for Eliza. when it's cheap stock up!! This place at People's Park Complex (PPC) called CKKY trading (i think) at the 3rd floor sells my fav Pigeon wet wipes at 3 packs for $9.30. err..cheaper than most places by at least $0.80. not worth going there just to buy it but since my mil & i would periodically go there to buy our toiletries, lotions and household cleaners, it's like mega shopping when we're there. I started buying Kodomo laundry detergent, so I just con't to use it lor. It was $6.50 for the refill pack, which is only $0.40 cheaper than NTUC when it's on offer. not much huh? then again we don't use a lot of it. I think I've used only one refill pack since Eliza was born...and i have 2 more in the store. i think i should stop buying it. We have been using the Pigeon one while Ww's nephews were here...so of course we con't to use the same brand. gosh..sometimes i think brand loyalty is really powerful. The cheapest i've seen so far is at the Isetan sale at 2 refill packs for $17.90, then it's at Kiddy Palace for $18.90. Not worth buying at PPC cos it's $9.90 per pack. This one finishes fast! i've used at least 3 packs since Eliza was born. I haven't started buying anyway, still using the Cradle Cap shampoo we bought from the clinic even though she doesn't have any cradle cap anymore. But i bought the SebaMed one today at $11. no idea how much it is elsewhere...only managed to find a US site selling it for US$10.95. I think this will last very very long. This is one thing i don't scrimp on. For all the savings on other things, it's seems like i save $ on the others to buy this, Mustela Cleansing Cream. I think it's almost $20. I bought lovely nice-smelling Pureen one previously, it was ok initially, but after she was diagnosed with eczema. I started looking for soaps that will be suitable for her skin. Mustela worked well for her, as when i went back to use the other soap, she started showing signs of dry skin. She's a baby...dry skin?! so she's gonna be like mummy...dry skin for life. Anyway, the dermatologist said that it's hers isn't something that will be cured...but prescribed a cream that worked wonders for her, thank God! but it comes and goes..so as long as it doesn't irritate her, it's good. ok i admit it feels good to buy things at a lower price, anytime anyday. Eliza was still pooping watery stools and last night at 130am after her milk, she vomitted all over herself and me. 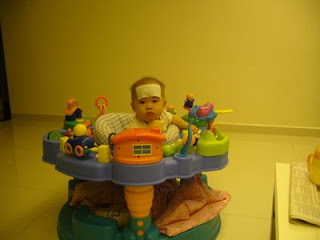 This morning i saw red rashes all over her body, esp her face and neck. After some discussion with my mil, i suspected it's fake measles (after hearing my friend mention it before). Checked it out on the internet about it and found it to be Roseola. 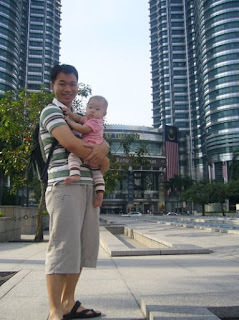 I was deciding whether to go work half day then bring Eliza to the PD or just bring her there in the morning. In the end i thought of saving the trouble of travelling oh so far and back, i decided to bring her in the morning and then take a childcare MC. No medication for Roseola, but the PD gave Lactose-free milk and anti-colic meds to minimize her diarrhoea & vomitting (i guess it's cos she wants to burp but in the end cos her stomach doesn't feel good, she burps out her milk as well). Meanwhile we just wait for it to go away. The good thing about it is that it's an almost lifetime immunity so she shouldn't be getting it again. It's like chicken pox, get it once and you're almost immune to it. I also can't be bothered about figuring out how she got it already because it's spread by saliva or when an infected person sneezes or coughs and because a child is contagious before he has symptoms, there's often no way to avoid exposure. It could be anywhere and anyone. Just that this felt more draining than when she had flu, i wonder why. And with all this my mil says that it's cos of the weather, cos she's heaty, etc etc etc that she got it. that's the thing with the older generation..sometimes i feel so frustrated by all her comments. (ie cannot let her cry too much else got wind in her stomach, the food i eat heaty that's why she's heaty and thus get sick...) Ww says let her say, it's the way she is, so i gotta learn the art of ignoring these comments or not take the comments to heart. Praying Eliza gets well soon, and she'll be happier too. On saturday we went over to my mum's place for dinner...still with that cooling sticker and still with that frown on her face. This time with throat infection. We really don't know where she got it from cos everyone at home is healthy. I wondered if it could be because she went to market with my mil on tues. and it can't be on thursday when we went out with Angelia & Amos (gosh i hope lil Amos didn't get it), cos she started having fever when she came home. today my mil was talking and she was saying Eliza was really cranky on tuesday already, even though she wasn't having fever, crying to get out of her exersaucer which she felt wasn't her normal self. So i can only trace back to her getting the virus on 1. Sunday in church when someone sick played or carried her or 2. in the afternoon when my '81 friends came over. it's a torture having lil baby sick. this time is worse cos it felt like it lasted 3 days and still going strong...i've started calling Eliza Little Miss Grouchy. she'll wake up crying, and when won't stop till i carry her, when i pause to sit her on the table or sofa, she'll wail again. when my fil wanted to cut her nails, Eliza was quite unwilling to despite all the teasing and ended up crying (oh the loud crying with tears kind). I guess it's also tough on her. 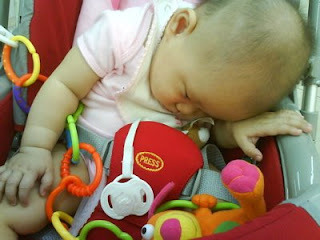 I brought her to the PD on friday afternoon after a persistant fever that hovered around 38+degrees. 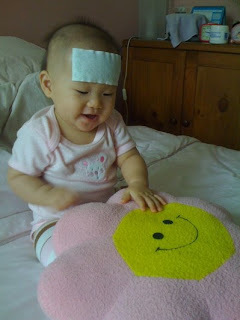 we thought that she was teething but i read that it's usually a mild fever, if there's fever, and it can't be that high either. The PD was worried that it could be the UTI cos she has no signs of runny nose, no diarrhoea, no ear infection...and finally checked and confirmed that it was throat infection. 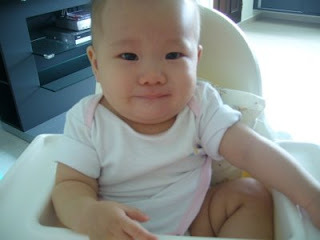 my poor darling...she has cut her milk intake by more than half and refused to eat her solids (except today's one). and everytime she drank her milk, she'll stop and cry, or stop and choke and then cry. yesterday she was burping (or vomitting) quite a significant amount of milk and water out. 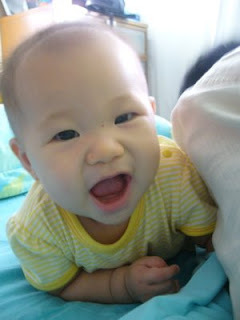 today it has been better and there was no more vomitting. However, she has been pooping very frequently, as much as 3 times today and it's getting more and more watery. Last night she did her vomit & poop which got us so worried that we almost brought her to the doctor. (we got out of the house, into the lift, and after Ww & I wondered what the doctor will do, since we just went to the doctor the day before, we decided to wait and see, and so we got back up the lift and went home). My mil was so worried, she scolded us for not bringing her to the doctor, saying that if anything happens to Eliza, we'll be responsible. But after consulting Dr.RJ, we felt a lil more assured. The diarrhoea could be due to the antibiotics Eliza was on, and as long as she was not lethargic or listless, it's still ok. Fortuntately Eliza wasn't so lethargic like the day before, and i think the expulsion of stuff made her feel better so for an hour she was happily squealing and playing. I told myself if she doesn't get better, then i'll bring her back to the PD on monday. So latest updates is that Eliza's fever has gone down after going 'roller coastering' (as high as 39.3 degrees) since thursday night. i sometimes see a 37.3 and highest so far is 38.0. still she's just like how Little Miss Grouchy will be. Thank God her cousins are here, at least she isn't so bored being cooped up at home. I've been wanting to go out to check out the Library Sale, take a walk with her but both of us have been stuck at home. Praying that Eliza gets well soon, and that bad throat of hers will recover, i guess it must been quite painful for her to eat & drink milk. It's been so nice seeing her get chubby until now, she's on her way to losing weight again. 2. Eliza started saying "mmm mmm mmm" one or two days back. 5. Eliza's still face rubbing us when we carry her. 9. Eliza is still discovering her lil fingers. I love seeing her analyze her fingers, closing them and opening them, wriggling them and wondering how it works...so cute! chanced upon this photography website...love the photos they take. these are the kind of photos that have feel to them, that is really unique to the child and the family. anyone wants to get a pkg for Eliza? heeheehee...maybe we'll do a photoshoot when she turns 1.
i think most parents know that it's not good for babies under 2 to watch tv. I also know that. 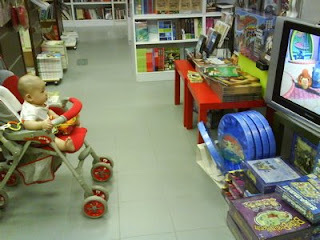 However, there are so many dvds for babies in the market. there's Baby Einstein & Brainy Baby etc etc. 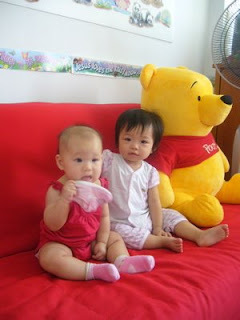 I wanted to buy the Baby Einstein cos i heard about it, know mums to let their babies watch it and enjoyed it. I thought I can go get it cos it's selling cheap in the forum....well...until i read this article at Time.com. "These products had the strongest detrimental effect on babies 8 to 16 months old, the age at which language skills are starting to form. "The more videos they watched, the fewer words they knew," says Christakis. "These babies scored about 10% lower on language skills than infants who had not watched these videos."" We discussed about it and Ww suggested that it's cos when babies and kids watch tv they don't get to interact with people and that's the problem. I think so too...tho sometimes i think tv does really give parents some relief from a toddle who can't play on his/her own. I quote: "He and other experts worry that the proliferation of these products will continue to displace the one thing that babies need in the first months of life — face time with human beings. "Every interaction with your child is meaningful," says Christakis. "Time is precious in those early years, and the newborn is watching you, and learning from everything you do." So just talk to them; they're listening." I do intentionally let Eliza watch the "Teach You Baby to Read" vcd but i try to be there with her to teach it with her. Then again..she's more interested in the music and songs part and won't last 5mins watching it. Although sometimes i really feel like i want to park her in front of the tv so i can get some things done. It hasn't happened too often, thank God. OK...so i'll not buy the Baby Einstein DVD...save $70...and think harder on more creative things to play. 1. It's easier to sleep when she's in our bed. I feel like i do get a full 7hr sleep, even though i think i wake up at night or early morning to adjust her and find her pacifier to get her back to sleep. I don't have to crawl up and down my bed when she rouses in the early morning, zombified. I'll plop at the corner of my bed and hope she doesn't rouse again. I think so too. 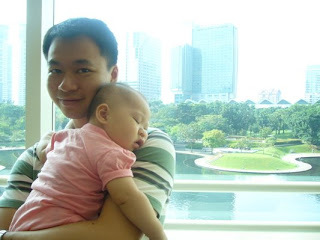 When i put my arms around her or just hold her, it calms her better and she sleeps better as a result. It's a happy problem actually. Not c0-sleeping makes things more difficult for me, essentially. Or should i just get her used to sleeping in her own bed (which she does in the early part of the night)...and worry about upgrading her into her own bedroom next time? 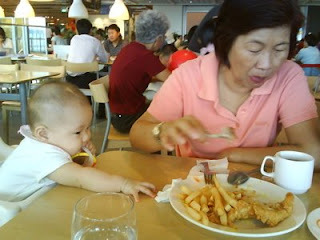 This was taken quite a while ago...my itchy hands gal wants fries even tho she's chewing on her teether fish. and they go on doing their own stuff...Eliza..the shoes taste nice?? 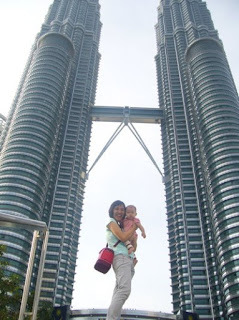 I'll blog about KL first..even tho we had a lot of activities prior to the trip that kept me so busy. The packing was quite a hassle actually, considering i'm still expressing milk for Eliza, so it's all the bottles, container, pump...and then packing for meals also require quite some planning as well. Clothes are quite easy. And our stuff? even easier. so we managed to pack 2 backpacks, and one bag to keep milk cold. my mil was more concerned than us about the packing, i only properly packed everything (almost) into the bags at like 11pm the day before. honestly becoming a mum, and then traveling with baby, makes you more organized...somehow. I had to visualize the entire journey and what might happen to make sure i'm prepared and have the necessary stuff. Anyway it was nice to be out of SG, for a lil while, just that the 6hr journey there and 6hr journey back wasn't too fun. especially when you can't walk up and down the aisle. even tho it's the luxury bus and there's more leg space...Eliza's not gonna care about that. on hindsight, the journey there wasn't too bad...it was the journey back that was tougher. Eliza was very clingy to me, which i think was due to the new environment. and by the 2nd half of the first day, she doesn't even want daddy! poor Eliza had a 'fright' moment the 1st day afternoon. the teachers were to have a bonding programme, and cos i was busy expressing milk and packing stuff, Ww brought Eliza to the ballroom first, only to come back few minutes later with Eliza wailing the hotel down. what happened was that when he entered the ballroom, everyone turned to look at her and said hello to her...that startled her so much she started crying. oh..the pacifier was quite overused during the trip which was a sanity saver...esp when i'm not free to carry her..and when she fusses in the bus. got a new cloth book to keep her entertained but somehow everything else is more interesting than her toys! Bathtime is a really fun time! And we have a real bathtub to play in!! Eliza was getting sleepy already cos it's her nap time...so while mummy & daddy happily smile away, she's thinking "can i go to sleep now?" and yes she did...snooze away! 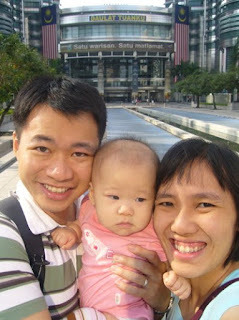 Anyway, we did a long shopping time at mid-valley shopping centre. i fell in love with the BabyGap swimsuit for Eliza but it was too small (3-6months). it was selling for half price but no use buying something she can't wear. eventually after browsing so many so many children stores, i bought a Guess sweater for Eliza for RM 69 (it was 30% off) as i needed one for times when she wears short sleeved clothes and in a cold place. i can't believe i'm so picky, or there isn't nice ones there. i was at Mothercare but still didn't buy anything!! I'm looking for dresses for Eliza to wear for BK&Huey's church wedding...ah-ha..so fun!!!! Feedback from this lil trip? 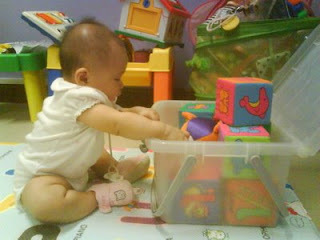 - It's more inconvenient when baby is still transiting into solids. Why? Feeding was quite a hassle. It was messy and it didn't always end up well. we only had 2 successful feeds out of the 4. one had to be on the bus which we tried but abandoned the attempt after Eliza didn't seem to be in the mood at all for it. - this is the age separation anxiety kicks in. and baby will need mummy more in an unfamiliar place like this. honestly i like the feeling of being so wanted by her, i love to hug her, snuggle her, play with her, have her hug me all over as if she wants every lil part of me, have her move back while i carry her to take a look at me, or wriggle in sheer excitement of having being carried by me. maybe we'll try again at the end of the year (i was thinking Phuket). Ww says no more trips cos it's so inconvenient and tiring. i'm thinking twice...but i think she'll enjoy it a lil more when she's abt 1yr old. anyone has got any takes on this? Update more soon...i feel so busy with catching up on other things blogging isn't really one of the stuff to do first. It was such a busy week last week! Met Yan for lunch at Plaza Sing. 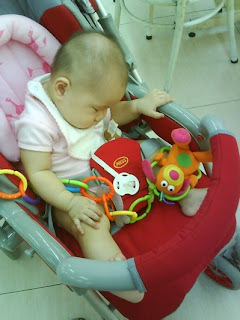 Lunched from 1-3pm, during that time, i fed Eliza her lunch and Eliza took a long nap. why the hat? it's hot at Secret Recipe! Also cos she was awake since morning and didn't even nap on the mrt! This was quite a record...5.5hrs since she woke up. gosh! 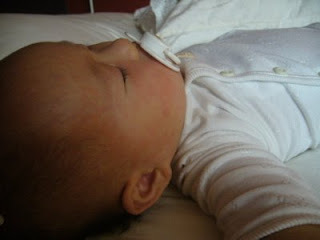 After that i went to buy ribbons and cloth to (hopefully) sew some blanket-tag thingy for Eliza. Then popped to the supermarket to get stuff, met back with my mil (who was out with her friends at PS too) and took a cab home. Long day! I wanted to pop by my office but then we just didn't have enough time. 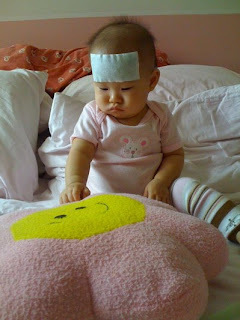 Eliza had her Hep B vaccination, which she did cry a loud but short one. (the needle looked quite long!) Nothing much else for the day except that she tried porridge for the first time and loved it! yays!! 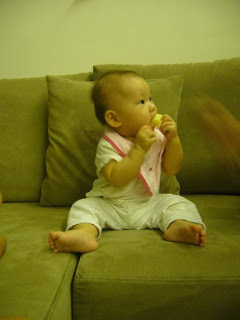 Eric was leaving for Sydney for studies and so we had cell at the airport...Eliza joined us and enjoyed her Healthy Times Vanilla Teething biscuit. It was a big mess anyway. She also stayed up past her bedtime cos we only left the airport 8plus, but she was a chirpy happy gal while we had our dinner and enjoyed the company of many uncles and aunties. Went to meet my JC friends for dinner at Suntec. oops...no pics yet..reached home only at 10pm. We took the mrt home cos it was pouring and the taxi queue was so long! 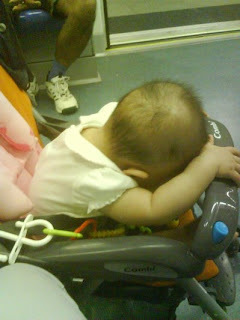 Daddy trying to close her ears...so she won't wake up from the loud loud announcement in the mrt station.